BOTANICALS and fruit essences take centre stage in a new lower ABV and low-calorie spirit from Diageo Reserve, which has been created with summer in mind. 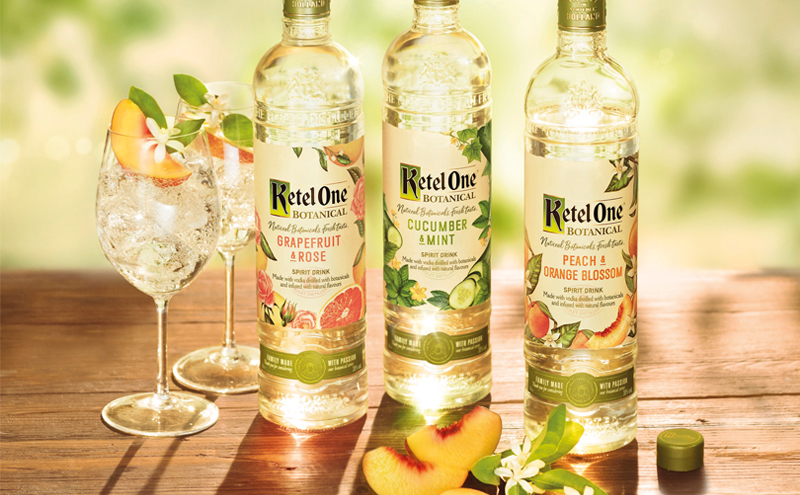 Ketel One Botanical is a series of three flavoured spirits from the premium brand, comprising Peach & Orange Blossom, Cucumber & Mint and Grapefruit & Rose expressions. The drink, which is created by blending and re-distilling Ketel One Vodka with a botanical recipe and the addition of fruit essences, has an ABV of 30%, no artificial flavours and contains 82 calories per serve. The new drink is designed to suit current trends of low-alcohol cocktails and spritz-style drinks; the signature serve is Ketel One Botanical Spritz, which is made by mixing the spirit with soda water.